Use the demo platform to become familiar with the Trader Workstation (TWS) or add your own Application Program Interface (API) to fine-tune your trading program. 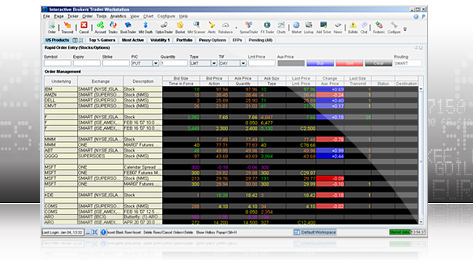 Install, upgrade, or downgrade the Trader Workstation (TWS). Create a paper trading account to test the capabilities of IB platforms. Try the TWS, WebTrader, and Forex demos. Compare the requirements and capabilities of our trading platforms. Instructions and requirements regarding setting up your own API. Log into the WebTrader platform.